Welcome back to Milk Bar Mornings for part three and the conclusion to our Serenity of the Guitar mini-series. To finish off Serenity of the Guitar we will be looking at pieces from the first three Zelda games, The Legend of Zelda, The Adventure of Link, and lastly A Link to the Past. These three games fully introduced the series and all of its potential, leading to the masterpiece of a series we have today. So to honor what these three games have done, we will be looking at the title theme from each of the three games. For those just coming into Serenity of the Guitar, we are looking at covers of songs from the Zelda Series for the Guitar sheet music book, which contains various themes from the series. Like always, we will be looking at various technicalities from the songs as well as the story. With that in mind, hit the jump to see what we have in store! To start off our list we will be looking at the game that started it all, and the song that started it all, the Title Theme from the original The Legend of Zelda. This game is what can be rightfully known as the first action-adventure game in the market. The game was open, vast, and mysterious, something never truly seen at the time. All that the players were given was the backstory, leaving the players and their imagination to make what it could out of the game. This simplicity was something that was not just new, but thrilling, making the game feel less like a game, and more like an adventure. The theme for this adventure was not just grand, but it was beautiful, and when it was exported to the guitar, it came off as something that can easily be called better than the original. The story behind this theme is a story of exploration. Most of the people that played this game at release had never dreamed of seeing a video game to be non-linear and open, letting the player use their imagination when exploring the game, and use their minds to solve the many puzzles. The lack of marked locations and any general help let the player explore the game for themselves, engrossing them for hours on end. The simple fact that the guitar cover stayed true to the original mirrors the gameplay, by letting the players use there imagination for what adventures are hidden behind the song, giving those who play the song, the chance to re-explore the game. Next we will be looking at the game that introduced changes to the series, The Adventure of Link. This game is always seen as the black sheep of the series, being an RPG side-scroller, rather than having the original top-down perspective. The game introduced various staples in the Zelda series, primarily the magic meter. This game also marked the first appearance of Dark Link, foreshadowing the various Dark Links and Shadow Links we have in newer releases. 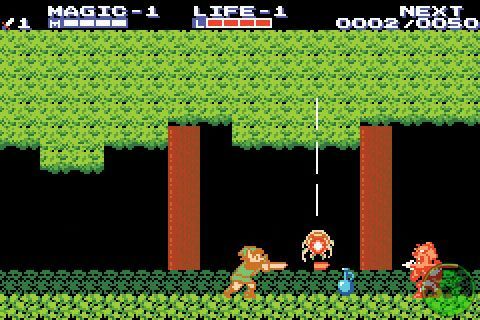 The theme for the song stayed true to the uniqueness of the game as well, by being an entirely original song, never featured in a Zelda game other than Zelda II. Again, the theme, when brought to guitar, stays true to the original, yet the underlying tone has been changed, going from a more mystic feeling to a tone that feels more appropriate of a quest, and this tone definitely is mirrored in the story. The story behind this is a story of aging. 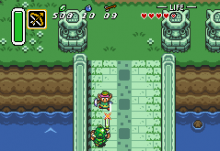 In the game, the player controls the same Link from the original is played as, now a few years older and on a new adventure. He has become older, wiser, and much more experienced. This adventure feels different, and not as nostalgic as the first. This strange feeling is present throughout the game, and the feeling of a more quest-appropriate tone rather than the mystic tone in the original shows how Link and the player have aged since the original. This theme is most likely the shortest title theme for a Zelda game to date, yet it still features many things that make it a great song. A strong opening, middle, and end, a tone, and a story are entirely present throughout the full 28 seconds it lives in. A Link to the Past is seen to many as the best Zelda game to date. It features a great story, lots of content, and lets the player travel through two worlds. This game introduced the basic structure for many dungeons, as well as defined the exploration style throughout the series. Together the game molded together the Zelda series to something that can be viewed less as an open-ended quest, and more as a proper adventure with goals to fulfill. When brought to the guitar, the composers took the theme, and made it much more gritty rather than grand. Usage of solid notes rather than three note chords, and hitting all the high notes in the opening, creates a piece that both represents the action-adventure aspect of the game, but the ending is a calm arpeggio, representing the aesthetics of the game. The story behind this piece is a story of hard work and pay-off. Through out the game, Link must face losses, whether it be his uncle, or his own blood, Link has to fight his way to the end, yet he does it all with a goal: to save Hyrule from all the darkness inhibiting it. This represents the hard work he has to go through, from fighting monsters twice his size, to avoiding being caught by guards, he must spend hours struggling his way through Hyrule and the Dark World. Yet once it is all done, he will be able to enjoy the world as it is, and as it should be: calm and beautiful. Alongside representing action-adventure and aesthetics, the opening, middle, and end also represent pieces of the story. The descending notes of the opening represent the quest coming upon Link, and the main middle part represents the battles and struggles Link must go through. Finally, the ending arpeggio represents the pay-off brought upon Link, making it all be worthwhile in the end. That is all for Milk Bar Mornings, and for Serenity of the Guitar. But who knows, maybe we could explore the Zelda Series for Piano in the near future. But for now, let me know what you thought of this issue of Milk Bar Mornings and the Serenity of the Guitar mini-series over all, in the comments below. Thanks for reading!